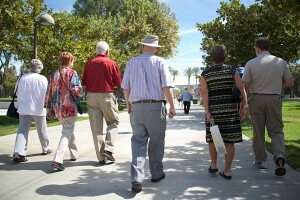 Alumni stroll along Cleary Walk, during last year’s Founders’ Day event, taking note of the changes since their days on campus. Photo by John DuBois. The event, which begins at 10:30 a.m. in the University Student Union’s Northridge Center, is in its sixth year. Alumni, faculty, staff and friends from the Valley State era are welcome to attend. 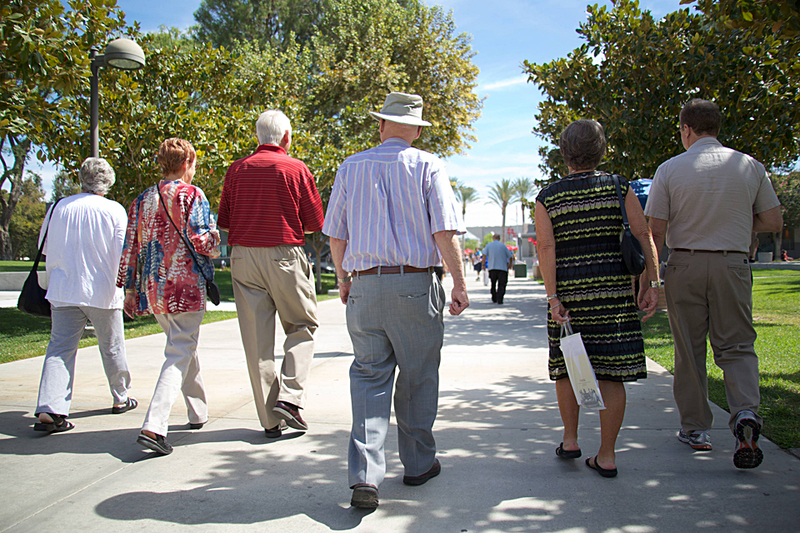 Alumni who earned their degrees in 1963 as well as faculty and staff who began working at CSUN in 1963 will be inducted at the event into the 50-Year Club. California State University, Northridge was founded in 1958 and originally called San Fernando Valley State College. The day will include a luncheon. Attendees can look forward to campus tours, including a visit to the Valley Performing Arts Center, the Student Recreation Center, the newly opened Oviatt Library Learning Commons, and various college and department receptions. Tickets for Founders Day are $35. To purchase tickets or for more information about the event call (818) 677-1300 or visit the CSUN alumni association website. When: Friday, Sept. 20, 10:30 a.m.
RSVP: Open to all on a space-available basis. RSVP by Sept. 12 via the alumni association website or by returning the invitation reply card.